Gorgeous Vacation Home with Spectacular Southern Mountain, Lake & Fairway Views! Spectacular Monterey Vacation Home! This property is located on one of the most desirable streets in Monterey Country Club Cordoba Way a quiet cul-de-sac with panoramic southern mountain views overlooking a tranquil lake and fairways beyond. Also located very close to the clubhouse only steps away you can enjoy the dining facilities and snack bar. This popular 200 plan with 2 bedrooms and 2 baths makes it perfect for one or two couples and is furnished with luxury in mind. A large sectional sofa and comfortable reading chair are situated around the fireplace and flat screen HD TV in the great room but also offers sunny mountain and fairway views through wall to wall windows. The formal dining area seats 4 and there is casual dining for 4 in the spacious kitchen. The kitchen with ample appliances is a cooks dream. Well equipped for every cooking need and supplied with wonderful cook ware and serving ware. The master bedroom suite has been furnished with a comfortable quality king size bed, beautiful linens, cable TV, writing/computer desk and the private bath with walk-in shower has a wonderful spa feel. The guest bedroom is equally luxurious with queen bed and cable TV and located just across the hall from the guest bath with a traditional shower/tub combination. 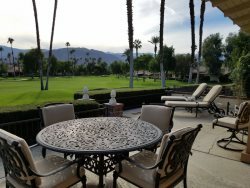 The south facing back patio which overlooks a large lake with fountain and the East 1st fairway beyond offers the very best in outdoor desert living. Furnished with a barbecue, table and chairs for four, and two chaise lounges guests will find themselves enjoying many sunny hours relaxing and entertaining in our beautiful winter climate. All furnishings are high end, quality and not furnished as a rental property. Guests will enjoy the feeling of this well-loved and well-maintained second home. Amenities also include cable TV, Wi-Fi and free local, US and Canada long distance calling. No Smoking and No Pets! Incredible views from the patio & very comfortable condo for us. Liked it so much we are returning next year!